Northern Goshawk? Who You Gonna Call? Rock Dove Tours! I’m fifteen minutes late! And worst then that it’s because I had to return home to add Worchester Sauce to the crockpot dish I’m cooking for dinner! I mean come on! I thought that March 15 was the last dinner I’d cook for the year! To make matters worse I’ve just listened to the wry comment of my brother, Bill, over the cell phone. “What kind of a big year are you going to have, if you’re derailed by a task like this!” Bill has a humorous point, but the wisdom that comes with being 61 years old prompts me to consider “No sense irritating Linda. She’s been a pretty good sport about this “Big Year” thing”. So I’ve just met Peter Gent in Boulder and now we’re driving his Subaru south on Colorado 93 to Sedalia, where we’ll meet Bill to try for the Three-toed Woodpecker. Rock Dove Tours on the road once again. On our 1998 Alaska trip, Peter and I decided that though Wings Nature Tours might have Jon Dunn and Gary Rosenberg as their leaders and Victor Emanual Nature Tours might have Kevin Zimmer and David Wolf, we’d have our own tour company. Rock Dove Tours. Our motto was “Half the price….but half the birds” designed to build up expectations and then deflate them. That kept us amused for the next ten years or so. And now Rock Dove Tours was in action again. While we’re driving south, Peter spots activity to our left, east of CO 93. It’s a raptor chasing a magpie. Peter yells out “Accipiter on the left”. I’ve just picked the birds up and answer “It’s pretty big, pull over”. Peter hurriedly swerves off on to the shoulder of the road where fortunately there’s a gravel pull off. I’m flying out of the car before the car even stops, not bothering to close the door. Quickly I find the bird in my binos. It’s big and the wings are pretty wide, but it took three wing beats and then a glide so it’s definitely an accipiter….could it be? Just then the hawk vanishes behind the tree line, but I calculate it’s going to show itself when it crosses the road to head west towards the mountains. Fifteen seconds later -and bingo, it did just that and this time Rock Dove Tours is ready! It’s big almost Red-tailed size. As the bird flies away we can clearly see the gray back and tail against the straw yellow background of the dormant grasses behind it. Both Peter and I realize by now it’s a Northern Goshawk! No doubt about it, hell, Rock Dove Tours is the only tour group in which one of the leaders (yours truly) was actually hit in the head by a Goshawk!! But just to oblige us, the bird lands on the top of a Ponderosa Pine 300 yards away. I get the telescope set up and locate the bird. The broad white supercilium stripe is clearly visible even at this distance. I start to whoop and holler! Need a N. Goshawk? Who you gonna call? Rock Dove Tours. Forty minutes later we meet Bill in Sedalia and now we’re 25 minutes late, but no longer care, this delay landed us a coveted year bird. The lord of the northern forests! A bird I could have consumed three days this summer in Rocky Mountain National Park to find. Even Bill refrained from a wise crack when he found out why we were late! And besides, fifteen minutes tardy is well within the parameters of Rock Dove Tours’ mission statement. From there things just got better. Ten miles up the canyon from Sedalia at the Rampart Range Road turnoff there are a lot of dead and dying Ponderosa Pine trees. 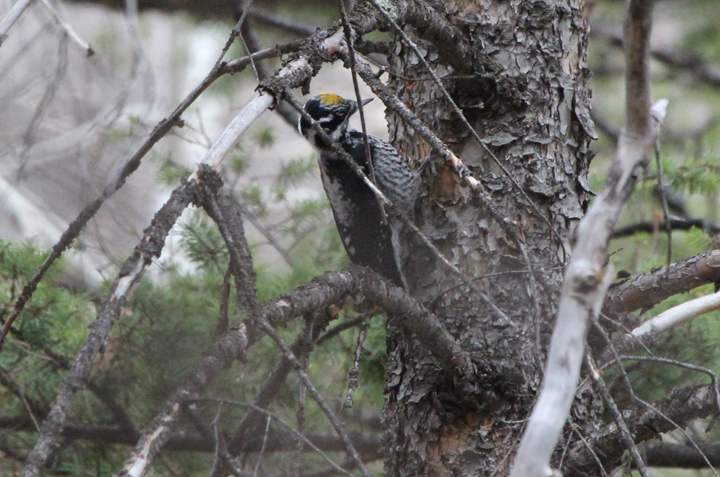 and the Northern Three-toed Woodpeckers are in here thick, feeding on pine beetles! We found at least three and most likey four birds within a half an hour. Bill also located another woodpecker, which I cavalierly passed off as a Hairy Woodpecker, but the white wasn’t on the back, but on the wing. 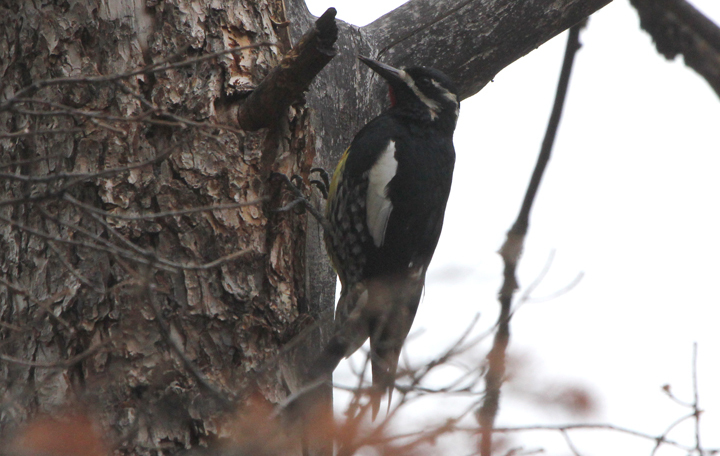 It was a male Williamson’s Sapsucker! Third new year bird on the trip. How successful can one be? I’m home by 12:00 noon. It doesn’t get much better than that. As I’ve noted over the course of this year, “little things” keep adding up in my favor. A minute earlier on Colorado 93 and we miss the Goshawk. Never have I been so happy to be fifteen minutes late! Rock Dove Tours may actually get a client some day if we keep this up, and we wouldn’t need to pay the client more than a couple of bucks! This entry was posted in Blog and tagged Northern Goshawk, Rock Dove Tours. Bookmark the permalink. 6 Responses to Northern Goshawk? Who You Gonna Call? Rock Dove Tours! Super! Super! 3 important year birds, including No. Goshawk!!! Way to go. John, I take it that Linda doesn’t have your URL. Watch out for Federal shutdown implications at Ft. Jefferson. Just to clarify. . . . . . . John did NOT “cook dinner”! I put everything IN the crockpot in the morning. . all he had to do was add worchesire (sp??) sauce and PLUG IT IN for God’s sake!! The joys of being a birding widow! AND regarding the “albatross sighting” in Florida. . I should get first right of edit!! As a matter of historical fact, Rock Dove Tours was founded on a trip to Churchill (in the late 1970’s, I believe) by Bruce Webb and Peter Gent. The motto of “Half the birds at half the price” was coined then. Many of the other facts in your blog are accurate :). Keep up the good work. Sympathies to Linda. Please include more recipes like the crock pot dishes in your blog, for the benefit of us home chefs. Rock Dove Tors will be on the road once again this coming Friday, June 24. Peter has designated Bill Kaempfer an honorary member.